I’m glad that you have taken an interest in purchasing a Life Insurance from Reliance but did you know that you can easily do it online? The internet is really an amazing thing, right? We can no do things from the comforts of our home. Before, if we wanted to purchase something, we had to get ready, dress up, commute or drive to our destination, but now, we just have to turn on the computer, connect to the internet, and viola! It is done! We can even get someone to help us through chat assist or through calling. So how can you purchase online? Let me bullet the ways. There are three Insurance Plans that you can purchase online and these are namely: Protection Plans, Savings and Investment Plans, and finally Unit Linked Plans. You must decide on which of the three it is that you want to sign up for. You will easily find the Buy Online button on the homepage. You won’t miss it for sure! Let’s just say you chose: Protection Plans. Under this, you will find two more choices that you need to decide upon. (a): Reliance Online Income Protect. It will be asking you some details like your gender (male and female), your date of birth, whether you smoke or not, what your annual income is and how long you want your policy to be. When I entered my annual income, the Sum Assured got inputted automatically, but you will still be able to edit it.Here is my annual premium: It isn’t as clear as I want it to be but my annual premium is 10,829 Lakh which includes taxes already. If you are satisfied with it, you may click on the PROCEED button. Yes, it’s that green one at the bottom. Once you have clicked on proceed, they will take you to a page where they will ask you to fill up specific information like your name, email address, mobile number, and your residence. At the end, you will be asked if you are buying the policy for yourself or for others so I’m guessing that it’s okay for others to fill up your policy if you don’t have the time. (b) Reliance Online Term. As I said, under Protection Plans, you will have two more choices, this is the second one. You will be asked the same things: gender, date of birth, whether you smoke or not, your annual income, how long you want your policy to last, and sum assured. If you are between ages 18 to 45, the minimum sum assured under this plan is 25 Lakhs. What will be your benefits if you sign up on this one? You will be getting 1 Crore life cover for just 15 Lakhs a day. It is affordable, you will be rewarded for living a healthy lifestyle, hassle-free application, you will be able to enjoy some tax benefits, and convenient medicals. If you need any help filling up the forms, you can give them a call at 1800 3000 8181. They have friendly, knowledgeable, and ready to help customer service agents. Other services they offer are:(A) Savings And Investment Plans:(a.) Reliance Guaranteed Money Back Plan. This will be able to give you the financial security that you need to cover the risk of uncertain and undesirable events. (b.) Reliance Super Endowment Plan. 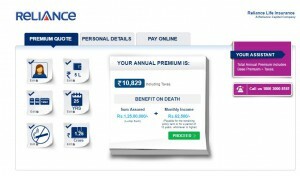 (c.) Reliance Increasing Income Insurance Plan. With this you will be guaranteed a regular monthly income that will increase every year, you can choose between a bigger paycheck or a lump sum amount at maturity, you will be able to protect your family, hassle-free application, and you will enjoy some tax benefits. (B) Unit Linked Plans(a.) Reliance Classic Plan II. What do you think of Reliance now? Do you like the plans that we have presented to you today? It may be time to buy a life insurance from Reliance online! Don’t forget to subscribe to us here at Best Insurance Deals! If you have any questions, feel free to drop a comment or hit us up with a message! We’d love to answer your questions! Have a great week!